The PowerStroke 3100 PSI Gas Pressure Washer is ideal for tackling all of your cleaning projects. From deep cleaning your car to power washing your sidewalk, this dependable machine will get the job done quickly. The PowerStroke pressure washer features a 25' hose for extended reach, helping you can get to far-away spots with ease. It has 12&quot; flat-free wheels for easy mobility, so you can take it with you on the go. The 3100 PSI Pressure Washer includes a variety of nozzles for different spray patterns and strengths: 0, 25, 40 degrees and soap, giving you a customized option for cleaning your home and other items. The onboard 1-gallon detergent tank provides you with an ideal 20:1 mixing ratio for optimal performance and easy soap application. The PowerStroke 3100 PSI Gas Pressure Washer is ideal for tackling all of your cleaning projects. From deep cleaning your car to power washing your sidewalk, this dependable machine will get the job done quickly. The PowerStroke pressure washer features a 25' hose for extended reach, helping you can get to far-away spots with ease. It has 12" flat-free wheels for easy mobility, so you can take it with you on the go. The 3100 PSI Pressure Washer includes a variety of nozzles for different spray patterns and strengths: 0, 25, 40 degrees and soap, giving you a customized option for cleaning your home and other items. The onboard 1-gallon detergent tank provides you with an ideal 20:1 mixing ratio for optimal performance and easy soap application. It has a large handle at the top so you can push or pull it around comfortably. The washer offers a max PSI of 3100. With a trigger handle wand, you can operate it with ease. 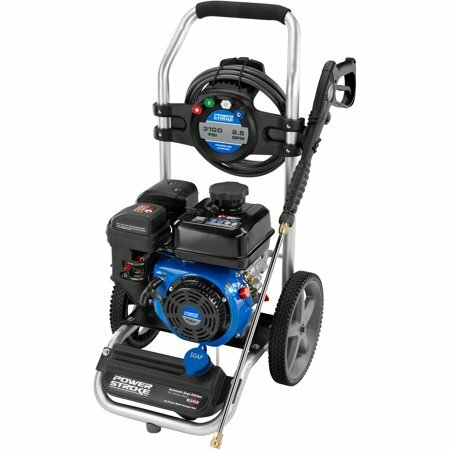 The PowerStroke 3100 PSI Gas Pressure Washer is made with blue, black and silver tones that make it stand out. HUSBAND ECEIVED THIS FROM HIS KIDS ON FATHERS DAY. HE LOVES IT!!!! WAS ONLY GOING TO TEST IT OUT & ENDED UP CLENING EVERYTHING THAT NEEDED TO BE CLEANED. HE CANT WAIT TO USE IT TO CLEAN THE SIDING ON THE HOUSE. BEST GIFT EVER..
Have used for about a month now, works great, fires right up. only used for about a month but so far so good. Buy it! You will love it! Great power washer! Great power! Started on 1st pull after assembling. I washed my truck, central air condition unit and then the waves on our house that had turned from white to almost black. It turned them back to white. During assembly though, the trigger handle holder did not match the two holes in the handle. The trigger holder piece that I received had just one hole that would not line up with either hole, so I had too drill a hole inbetween the other two on the handle. Other than that, I can't complain! Does this use straight gas or mix? 2. This is a 4 cycle engine, not a 2 cycle engine. All 4 cycle engines have oil in the crankcase with a separate gas tank, no mixing, just like your car. 3. always a good idea to use gas treatment such as Stabil (not a recommendation) which may keep the carburetor from gumming up. This was my experience. Also, when starting the pressure washer take off the nozzle and suppress the spray handle to keep water pressure from seizing the motor (easier to start). Lots of good fortune. 4. This uses straight gas. 5. This pressure washer uses gasoline with no oil mix. There is a separate oil reservoir that takes 10W-30 oil. There is a bottle of oil included with the unit. What make is the engine? 2. This pressure washer is powered by a 212cc PowerStroke engine. 3. The PowerStroke 3000 PSI doesn't have a Honda or B&S engine. The engine is a PowerStroke branded engine. Can you drain the oil out? 1. Yes. There are two 10mm bolts at the base of the engine, one on either side fairly close to the two red fill/check plugs. Or as mentioned in previous answers you can drain it through these red plugs. Getting to the 10mm bolts is a little bit inconvenient, I find it easier to remove one wheel completely. This gives me access and lets me tip the whole unit to let as much oil drain out of the drain plug as possible. 2. You are not able to drain from the bottom but from the oil neck of the product. 3. There is not a drain plug on the bottom of the engine. However, you can drain the oil through the oil filler neck.